Introducing a unique blend of pure ingredients that deeply moisturises your face, bringing back a youthful glow. Leaves you feeling rejuvenated, refreshed, and ready for the day. SHOW OFF YOUR BEST SELF! An exclusive offer on Anti Ageing Face Creams, not to be missed. For a limited time only, we are offering you a unique opportunity to buy our anti ageing defence and protect range for only £30. This includes our Ultra Rich Anti Ageing Face Cream Day and Night formula; everything you need to shield your skin during the day and deeply nourish it at night. Simply add both products to your basket and the discount will be applied automatically. SPECIAL OFFER. Get the Wild Thing Natural Hair Conditioner and The Lemonazing Chunky Shampoo Bar for only £16! You’re invited to get a hands-on feel of all our products, plus get 10% off your first purchase with us. At The Edinburgh Natural Skincare Company we use only the purest ingredients from mother nature to bring you products of quality, efficacy and long lasting value. 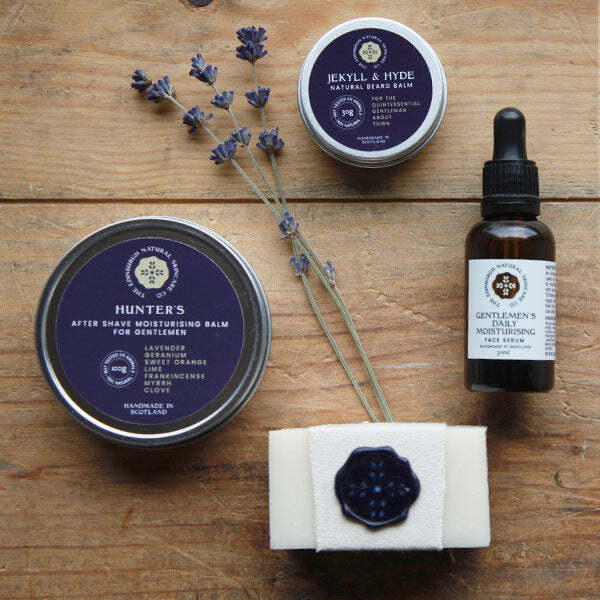 Our men’s grooming products have been carefully crafted with 100% natural ingredients to protect your skin and strengthen your hair, perfect for those who want to look their best. Tommy Crooks, founder of the Edinburgh Natural Skincare Company. I was in Edinburgh for the New year celebrations and I purchased this serum at a market. It is now March and I have been using it everyday and I love it!!! My face is so soft and smooth!! I am going to be using this product for a long time. Wonderful little pot of magic. Smells gorgeous and you wake up looking plumped up and perky. I use a whole pipette for a lovely facial massage before bed. It sinks in quickly and no residue on the pillow. Just perfect. Absolutely love this serum, it smells amazing and makes my skin feel so soft!! I bought this in North Berwick at the start of November 2016 & have been using twice daily since then. I’ve still not finished the bottle & my skin has never been better. I’ve got combination skin & have always been nervous to moisturise at night in case it made my face greasy. This oil has been amazing. My skin feels hydrated & healthy. I’ve not even had any spots or breakouts whilst using it consistently for over 3 months! I’m almost ready to buy my next bottle! Bought some of this serum about a month ago while visiting Edinburgh and I love it! I have naturally quite combination skin but bad breakouts so I’ve always used super cleansing face washes and barely any moisturiser, but decided to try something different as this has never really helped. The woman on the stall was so so helpful and let me try a little serum on my hands – smelt heavenly. I’ve now been using every night for a month and my skin is in such better condition! I actually have less oily skin! I’ve still had a hormonal breakout but they haven’t been as angry and have healed so quickly. So glad I can get this stuff online – although I think this bottle will last about 6 months from what I’ve used so far. I’m about to order a few bottles of this magic liquid. I’ve been using it for about a year now, as a daily under-moisturiser serum but also on my hair. I’d been using a couple of drops of another oil-based product as a leave-in anti-frizz conditioner, but ran out of that one and tried Symmetry, with great results. My husband also uses it as a shaving oil – he’s really particular about getting a good wet shave, and he reckons it beats any oils, gels or soaps that he’s used previously. Absolute magic! I purchased this product in North Berwick last September. The scent is wonderful and the oil feels so soft on my skin; not greasy at all. Will definitely be buying some more. I was given this divine serum as a gift and love it. I have sensitive skin which is prone to breakouts with most other serums…..but not SYMMETRY. The scent is so pleasing and my skin feels soft and nourished. A joy to use. By subscribing, we’ll update you with regular newsletters and special offers. *First Time Subscribers Only. Terms Apply. We believe in delivering the best care nature can provide. To support us, join us on social media at the following links.